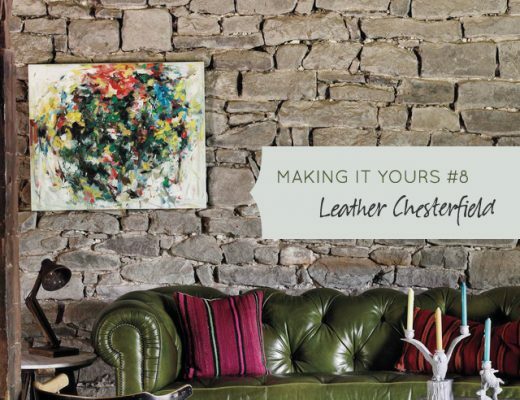 In this edition of Making it Yours, we’re following the Window Daybed as it shows up throughout a young boy’s life. The bed got its start in his childhood bedroom, and now we see it as he enters his teenage years. The boy is now 14 (ah, it seems last week he was just a little boy!). He and his dad repainted the walls, but they kept the daybed, painted dresser, nightstand, striped rug, lamp, and guitar poster. Now road signs replace the alphabet, and groovy bedding replaces cute monsters. The phrenology head is awesome (I gave one to Brandon last year), and yes, there is now an actual guitar in the mix. I have a soft spot for Danelectro because that was the make of my first guitar too (a Dano U2). The black swivel chair makes a good spot to sit and practice those pesky barre chords. 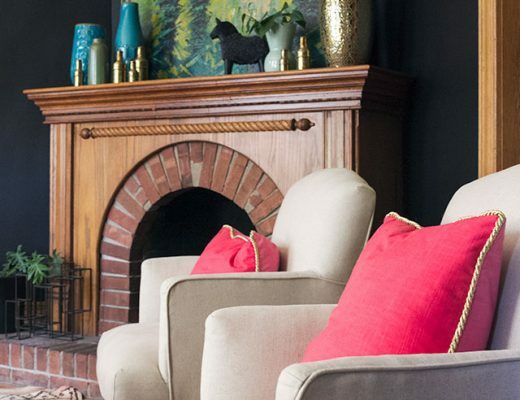 Next up, we’ll see the daybed in the living room of his first apartment. A couple of comments suggested adding a desk and some storage, and I thought that was a good idea. Consider this bookshelf, desk, and chair part of the room as well. I also had a little fun dirtying up the place. Literally and figuratively. Can you spot the new addition to the room? I normally love these MIY rooms but this looks a little over-decoarated for many teenage boys, particularly the sheets. You think so? Most of the room has been carried over from the last look (as it would be in real life). I thought the sheets were cool, and kind of spoke to the whole superficial fascination with Eastern culture and philosophy that a lot of young teens go through. The ones I knew did, at least! Wait, you forgot to photoshop in the pile of garbage, banana peels, and dirty socks!! I love this series! Although it’s making it become a furniture hoarder – I want to keep everything in hopes it will fit in the room later. Also, random question, did you get the Anthro poppies chair yet? I saw it yesterday and thought of MIL! *making ME become a furniture hoarder. Duh! I’m going to have to say that room would probably not fit any teenage boy that I have ever met. Even minus the accessories, the bed itself just isn’t going to fit most of the 15 year olds that I know are pushing 6 feet or so. 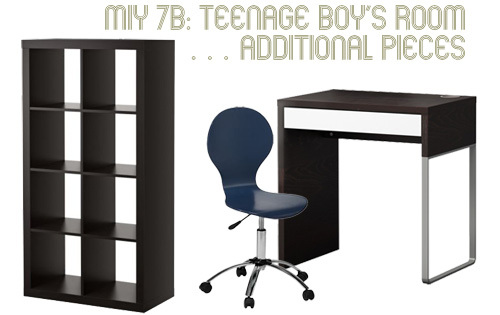 The chair could work for video games, reading comics, and playing guitar but there needs to be a desk and someplace to hide non clothing items. I’d have to agree. There’s no way my 17-year-old brother would fit in that bed. The footboard would be the biggest problem, not to mention the length and size of the mattress. His bed had to be upgraded from a twin to a queen last year because his feet hung off so much. Like Jessica said, the chair would be great for video games or reading books, but then you’d have to have a television stand and bookshelf (forget books, the shelves would be for game consoles and games). I agree, a desk or a bookshelf would have been a good addition here though. I added a few more items to the bottom of the post. Good to see the additions to the list. I know not all teen boys are going to be tall but most of the ones I know are. We are a family where the average woman is 5’11 and the men range between 6’2-6’5 and built like linebackers so I would envision something a lot longer and sturdy looking. For some reason I actually envision futon because its dual purpose and functional. All the men in my life are tall (my dad is the shortest at 5’10”) so I just always assume men will be tall. Just wanted to say that I love the additional pieces! I love how multifunctional that cubed bookshelf is, and it’s so much more “boyish” than a traditional bookshelf. My thought was that a teen boy just might not like the bed, period. I will admit that I am not a fan of the day bed in general, but this one is not one I would associate with a teen boy. The swivel chair though, that would be a hit. Heh. OK, I added a “dirty” version too! I dunno, I think she nailed it. Everything is spot on (in my opinion) with the one exception of maybe the sheets. I don’t think I’ve ever met a single male who doesn’t use plaid sheets for some odd reason. Like, small, shirty plaids. Although I could definitely see a boy with long blonde hair sitting on those sheets perfecting his concerned-for-the-well-being-of-mankind face that he plans on impressing girls with. I’m now reminded of how my parents refused to get me a larger bed than a standard twin, even when I was a bit too big for it. Designing for the teenage boy is a toughie. Most of the ones I knew added some posters of their favorite bands on the walls and piles of dirty clothes on the floor. Perfect timing Nicole-I’m re-doing my 15-year old’s room as we speak. I love the colors and street signs you chose for wall decor. I painted his room a moody, dark orange-brown color called “fresh baked pumpernickel” and he loves it. I found an old globe at a thrift store, along with some quirky monkey lamps. We bought wall mounts for his guitars, so that they can also be a focal point when you walk in his room. His great-grandfather has some cool things from the war that I am putting in shadow boxes and hanging on his wall. This was all done on a tight budget using mostly what we already had. 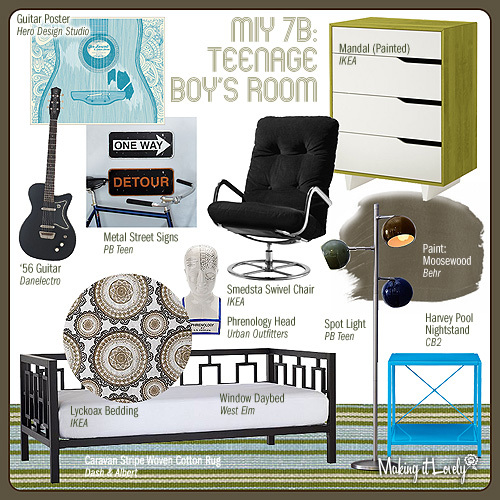 I love to see boys rooms! I’m sure you notice now having a boy….there is never a lot of boy stuff….clothes, shoes, decor……about 1/4 of the amount of things for girls! What program are you using to design your mood board/boys room? You’ve probably already addressed this elsewhere, but can you indulge me as a new reader? I’ve moved into a new place and have practically no furniture, so need to buy at least a few cheap IKEA pieces to tide me over. How can I paint something like the Mandal above? Sand and prime first and I’m OK? I was at IKEA twice this weekend, looking at items and wondering how I could make ’em work…..
Get a good primer (one that adheres to glossy surfaces). You can do a quick sanding with a very fine sandpaper to lose a little of the slick gloss, then prime and you’re good. Im not sure how I got here, but can you move in with my family and decorate our home? You are truly amazing! !